Inquiry-based mathematics: the posing of a problem is only the beginning of the problem-posing process. We’ve been exploring some of the steps to an inquiry-based lesson in mathematics recently. 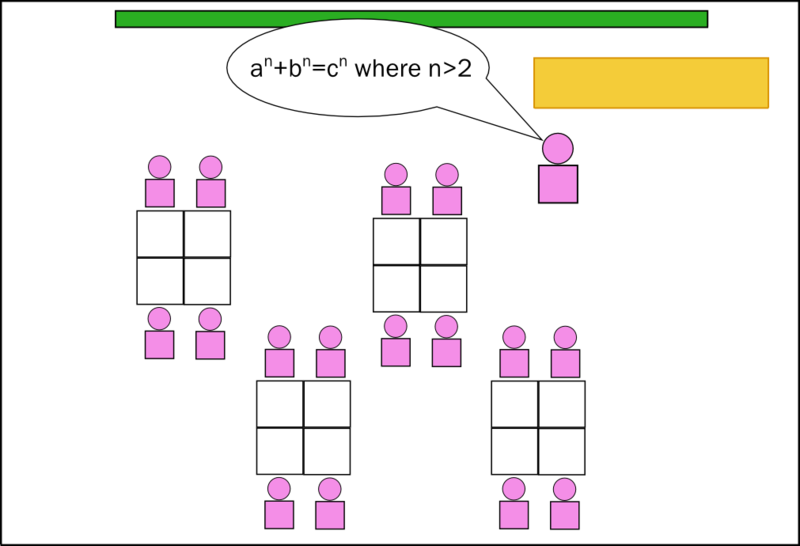 In the last post, I tossed out a few .png images and laid out a few general steps in preparation for actually getting into the meat of inquiry-based mathematics instruction. Which we’ll do so starting today. To oversimplify (more-so than I already do), the primary difference between an inquiry-based classroom and a traditional classroom is the placement of the problem statement: it comes before the instruction, thereby giving rise to the need for instruction. The problem is front-loaded, not the instruction. For a run-down of what makes a quality problem, there are lots of places to go. In short, they A) are interesting to students (either in the scenario itself or in the manner in which it’s posed), and B) have multiple entry points. It’s also nice if there are multiple pathways to a solution (or even has multiple solutions) but that’s not a dealbreaker. Now that you’ve got the problem, it has to be posed to the students. This can be done several different ways. Maybe it’s a video, a letter, a demonstration or a student simulation, but something delivers the problem to the student. New Tech calls this an “entry event”. Dan Meyer calls it “Act 1.” Whatever it’s called, it is intended to ignite student curiosity about the problem. However, the problem posing does not end after the problem is posed. The posing of the problem is only the beginning of the problem-posing process. For most classrooms, along with an “entry event” there needs to be a strategizing process in place for students. One way of doing this is the “Know/Need-to-Know/Next-Steps” process. Here, students begin brainstorming everything they know about the problem and everything they need to know about the problem in order to solve it. This can be done as a class or in groups, jigsaw style. Google docs is a nice tool. As is scrumblr and wall wisher. Of course, a white board works just fine. But even this neat sounding process is fraught with peril. 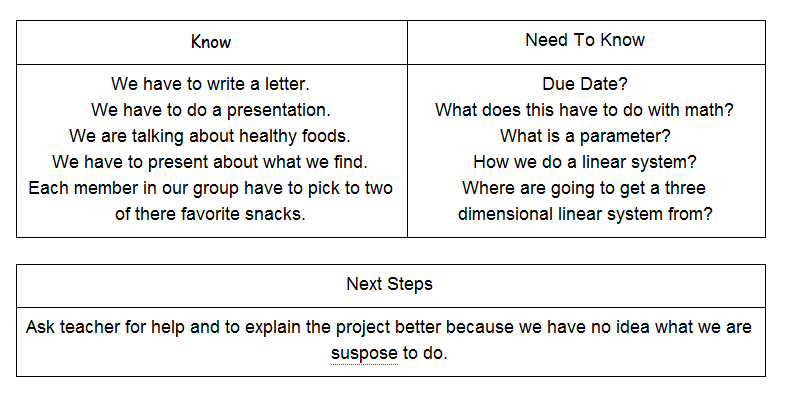 Here’s an example of Knows/Need-to-Knows I saw in a class the other day, captured in a google doc. I love this list. Not because these are good knows/need-to-knows/next-steps but because of precisely the opposite: it encapsulates what can go wrong with the K/NTK/NS process. As you can see, the knows, need-to-knows, and next-steps are not very mathematically rich. And frankly, if your need-to-knows simply restate the problem or are focused on things like “when’s it due?” then there’s really not much of a point to it. So how do we get from moribund knows/need-to-knows to mathematically rich (and useful) ones? It’s a difficult quandary. How do we get students to say things like “how do I find the zeroes on a graph?” when they haven’t been instructed on finding the zeroes on a graph? It’s a tough quandary, and frankly, you may not get students reciting the exact content lesson you desire. But here’s one way to prepare for this. Develop a list of anticipated knows/need-to-knows/next-steps and a list of desired K/NTK/NS. Then start filling in the questions you could ask to get from one to the other. Like this. 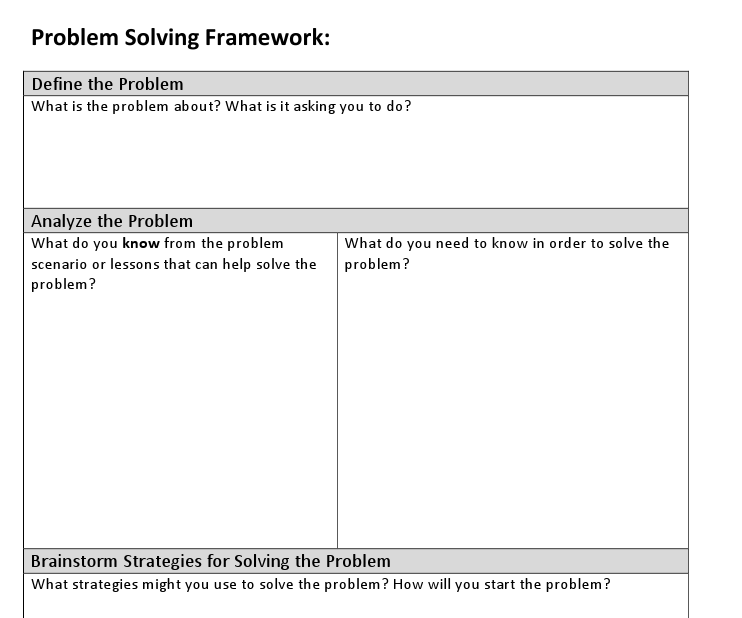 Try to anticipate the strategies students will come up with and generate questions that will steer them into a more mathematically and problem-solving-esque mode. Or better yet: try running the K/NTK/NS process with non-math teachers at your school, see what they come up with: I’m betting mathematically it’ll serve as a pretty good approximation of of student brainstorming. Perhaps the most critical act that can sink an inquiry based lesson is when a problem is posed and students are simply set loose without any guidance into their work time. I’ve seen it (and been a part of it many times): teacher poses a problem, students brainstorm, teacher sets students loose, students are unable to engage in the problem as the brainstorming process yielded very little in terms of actionable items. In general, I wouldn’t set the students off to work until they have a list of two or three potential next-steps along with two or three good need-to-knows. But then, that may be just me. Often teachers ask “yeah, but when do I actually teach?” when transitioning to a inquiry-based environment. The answer is: the nano-second after the problem is posed. Your instruction begins with helping students craft strategies and access prior knowledge that pertains to the problem. That’s as much teaching as anything else you could provide for students. Previous Entry:Based on this plot, can you tell me when it started snowing? Or, can we fit a sine curve to it? As always, it’s great to read about your thoughts with problem-based math. The question you mentioned receiving often, “but when do I actually teach,” stood out to me. I believe I teach every time I listen to what a student is thinking and I ask them a question that MIGHT encourage them to come to know something more fully. This same ideology drives how I try to plan PrBL units: decide on a task, let students play, listen to what they are thinking, and then try to decide what might be a productive prompt for them to think about next as they try to make meaning of the driving question. As students get older, maybe they can even decide on what that next prompt might be? I’ll be interested to see how you revise your thoughts on this!